Not working for me. Code expired? Ok. I didn't know you were referring to Super Mario games from previous consoles. Super Mario games is a bit generic. You don't new a subscription to buy games. let me buy Mario games for my Switch without having to pay an annual subscription please. And Zelda. Correct, waste of time posting with 20 minutes til closing. As much as I know your trying to help, that was a bit rude. He not entitled he was only saying something. Maybe not all Game store have those for free, I’ve been to one in Portsmouth today and they didn’t have those for free. The guys working there were even shocked that they didn’t remember that it’s Mar10 day! Me asking were the reminder for them. 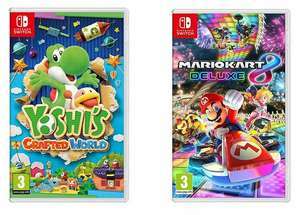 @Smash77 Mario Kart 8 Deluxe is available again, if you want to unexpire for that? Received today but my dock doesn't work. Spoke to Nintendo support and went through some trouble shooting, then they advised returning it. All recieved, but the switch making a funny noise when in the dock when is on, and also makes the same noise when playing hand held. i would describe the sound lime a clicking sort of noise like its trying to read a disc and cant so keeps restating the process. Is this usual ? Did any of you get email confirmation of your order? My attempt was declined by my card provider. I have been advised thar the seller is questionable? Any one else got this? 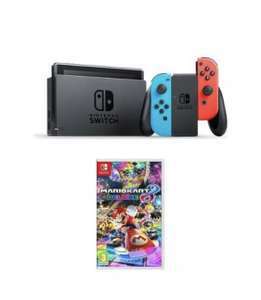 https://www.hotukdeals.com/deals/brand-new-nintendo-switch-games-console-neon-sealed-uk-pal-22999-gtrade2015-ebay-3195682 Ive just gone for the above- £199.50 using the Aussie code 'Purchase5'. Hoplefully its not a stitch-up! I'll report back on the above link upon reciept. Never miss a 'Mario Kart' deal again! They don't sell kids t-shirts !! Thanks just got my Mario mad son some T-shirts! Took delivery this morning. Thanks OP. Heat. Oooo I have a Currys Family Discount Card, can get this for £261 ..... tempting.. Heat added anyways, thanks! 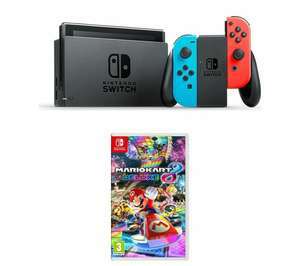 10% off with TECH10 voucher making the nintendo switch console and mario kart 8 deluxe bundle @£251.99 with 12 months argos warranty. Free Click & Collect with 30 days return. Can’t take credit for this deal. Came across it in the comment section of another deal but sharing is caring. Seemed a good deal at the moment. Really poor. Had to phone them up because they had trouble with my credit card. Three phone calls later (paid by me of course) it's sorted and the order goes through. Five hours later they cancel order and refund. Despite having 6 in stock when ordered. And now there's another second rate retailer who have all my credit card and contact details, for nothing. It's why I usually stick with Amazon and am happy to pay a few more quid. Lesson learned! Did anyone not get their order cancelled ? @Qadir1980 did you get a dispatch notification same day? And they just emailed you saying it’s cancelled today? Our left joycon broke, i think from playing smash. I am getting pro controller now. As a newb (actually a 47 year old whose son has a switch) can someone advise the difference between getting joy cons over a controller? I'm told we need extra controllers but have idea regarding pros and cons......thanks. Got mine for £2 on a yellow sticker but lucky for me. Good if still have stock. This is standard Curry’s with no stock, I’ve extended the range and non actually exist for the smash bundle. I have forgot the name of that Co. that the UK Nintendo store outsource to, but they probably found some of these in a cupboard, no doubt. Such a dissapointing game, everyone was cheesed of when it came out with the single item only and crap battle mode for multiplayer. Does it include the AOC Pack that is being used for the deal image? Also available for the same price is FM with Mario Odyssey. I got the code emailed yesterday and after a couple of games getting used to the controls it brings back memories of years ago when I used to play it. Deffo better than I expected and a great time stealer. All that and more, everything about it. Covered in many previous thread deals in detail why, so will spare others. 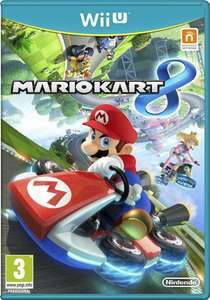 Mario Kart 8 in general or because of the 'deluxe' re-release? Was in stock in Derby yesterday. Used click and collect to reserve one. Hate Curry's PC World. Same price advised for a bundle with Super Smash Bros in-store, but they apparently don't have stock, despite having dozens of console display boxes, game display cases and showing as in stock in all local stores online.